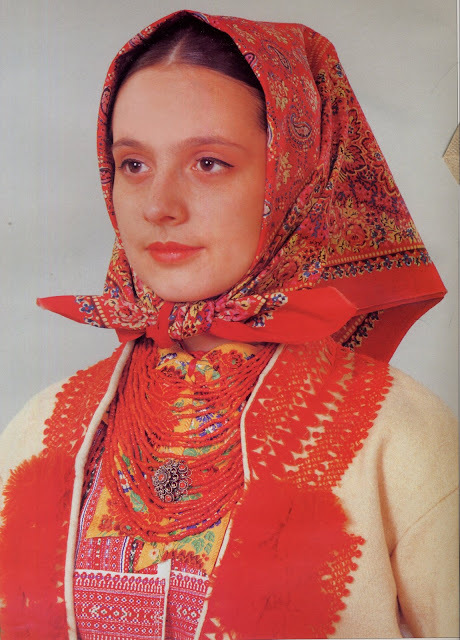 Today i am going to talk about the costume and embroidery of Zagrebačko Prigorje, in Croatia. Croatia is known to its inhabitants as Hrvatksa. For history and more information on Croatia see this article. 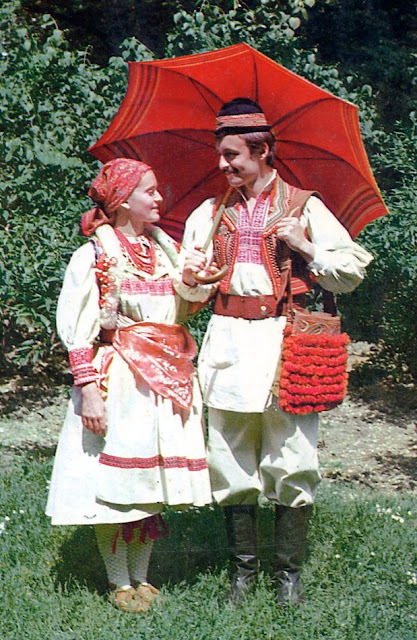 Croatia has an incredible variety of folk costumes. Ethnographers consider Croatia to cover three distict ethnographic zones, the Pannonian, in the eastern plains, the Dinaric, in the mountains inland from the coast, and the Adriatic or Littoral, on the islands and the coast itself. 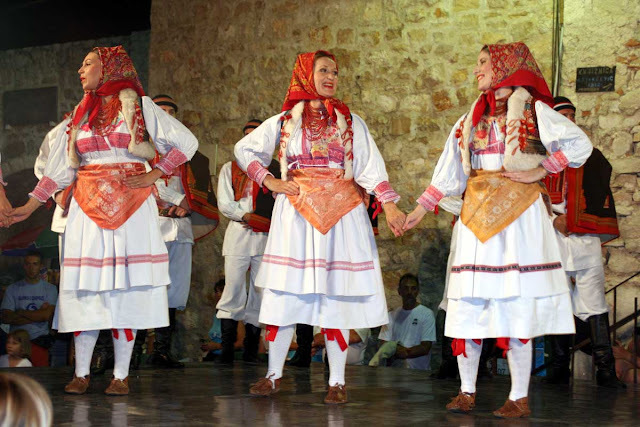 The people are mostly Croatian or Serbian, with small minorities of Italians, Vlachs, and Romance-speaking Dalmatians in Istria. Three major dialect families are spoken, one of which, the Shto dialect, is also spoken in Serbia, Montenegro, and Bosnia-Hercegovina. The Kaj dialect was traditionally spoken in the country and hills around Zagreb, and the Cha dialect is spoken on the coast, especially around the city of Dubrovnik. The costumes of the three ethnographic zones are very different from one another. Here is a map of Croatia showing roughly the exent of the three zones. Note that the zones actually extend farther beyond the borders of Croatia, but that is not the scope of this map. The Pannonian zone is shown by green hatching, the Dinaric by brown, the Adriatic or Littoral in violet, and this map shows the influence of the Alpine zone along the border with Slovenia in yellow. The region i am covering today, Prigorje, is found just outside the capitol of Zagreb and is marked on this map. 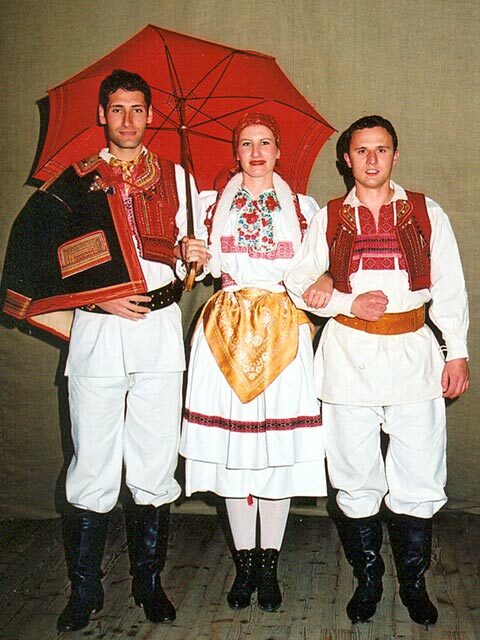 The Prigorje costume is one of two which are commonly considered to represent Croatia as a whole. 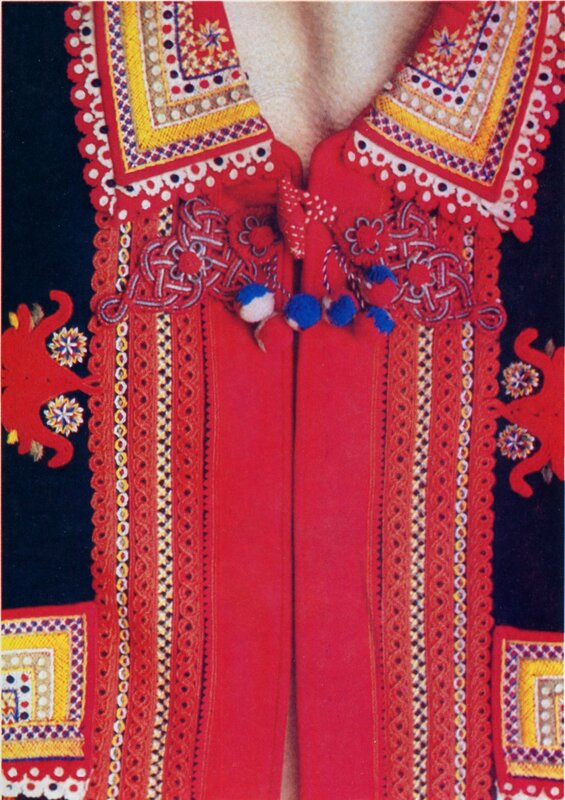 The other is the extremely beautifully embroidered Posavina costume. 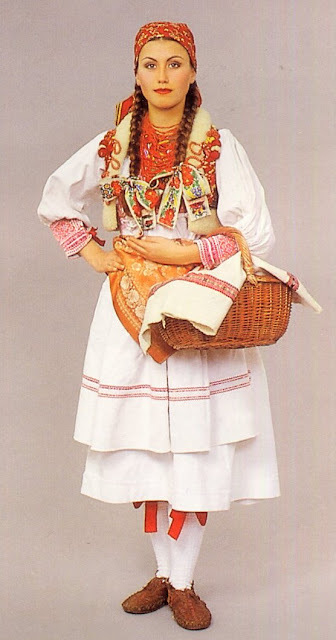 Here are some representations of the Prigorje costume taken from various sources. 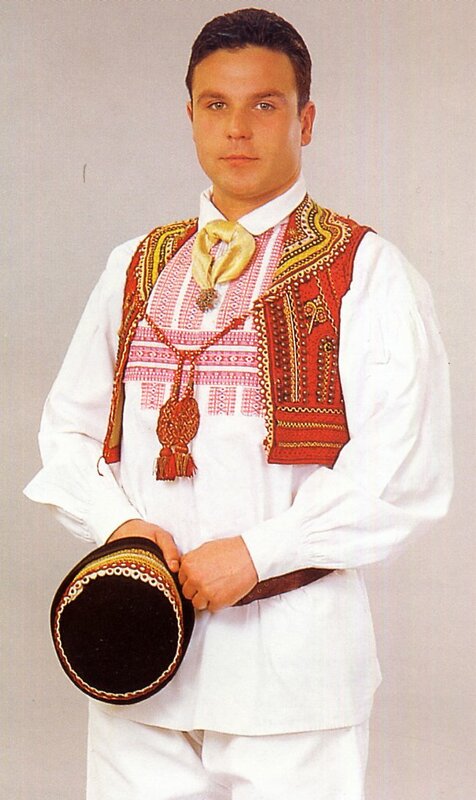 This costume is extremely popular with Croatian Folk Groups. This photo is of a bridal couple, hence the extra frou-frou on the woman's outfit. You can see that this costume is quite distinct. 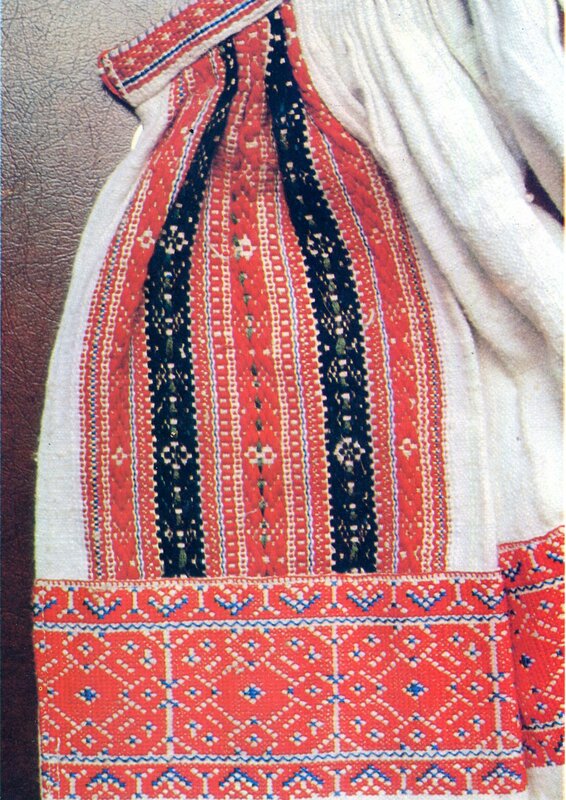 I have no information about foundation garments, but the first visible garment of the woman's costume to be put on is a linen blouse, known in this region as oplece. It is very short in back, but rather longer in front. Here is the cut. There is a band of woven ornament or cross-stitch embroidery down each side of the opening, which is pinned shut. 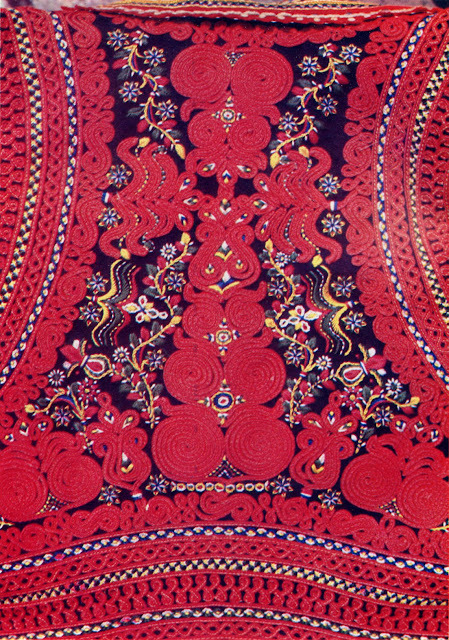 There is another piece of cloth with either embroidery or woven ornament sewn on crosswise at or close to the lower edge of the vertical ornament. Here is a closeup. 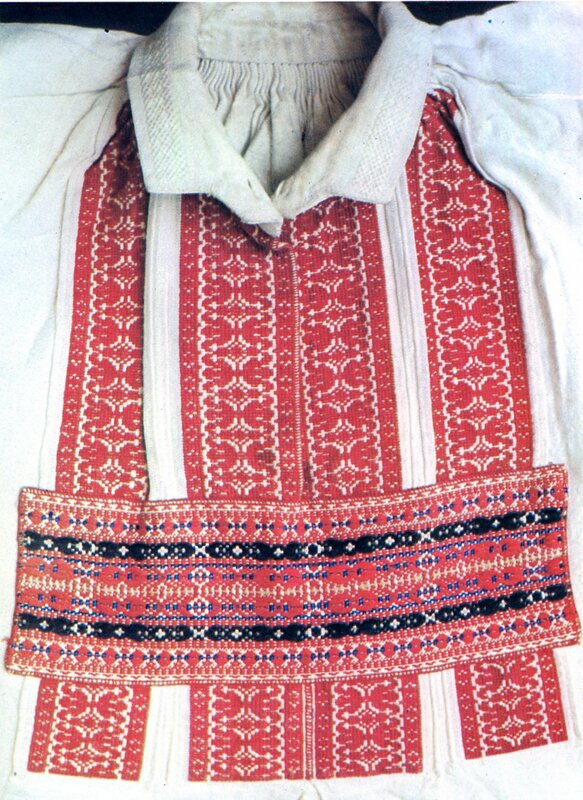 In this case, the vertical ornament as well as the neckband is woven, and the horizontal is embroidered. 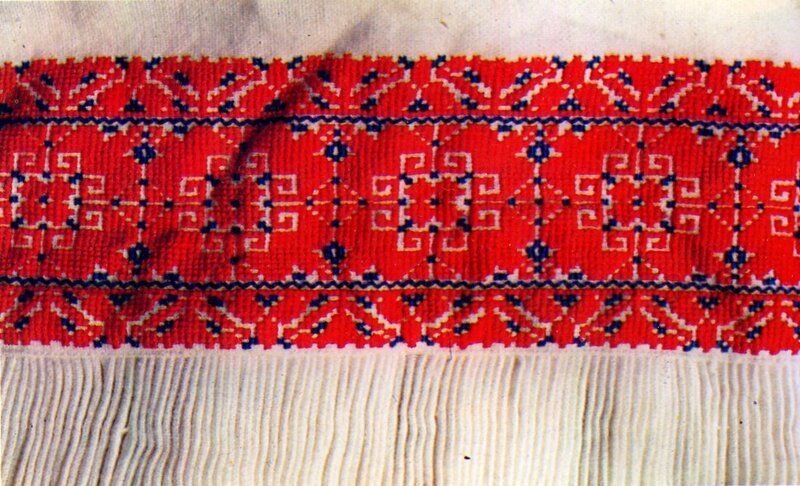 The vertical ornament is often [regrettabley, in my opinon] covered by a bow made of Czech ribbon, as in this photo. 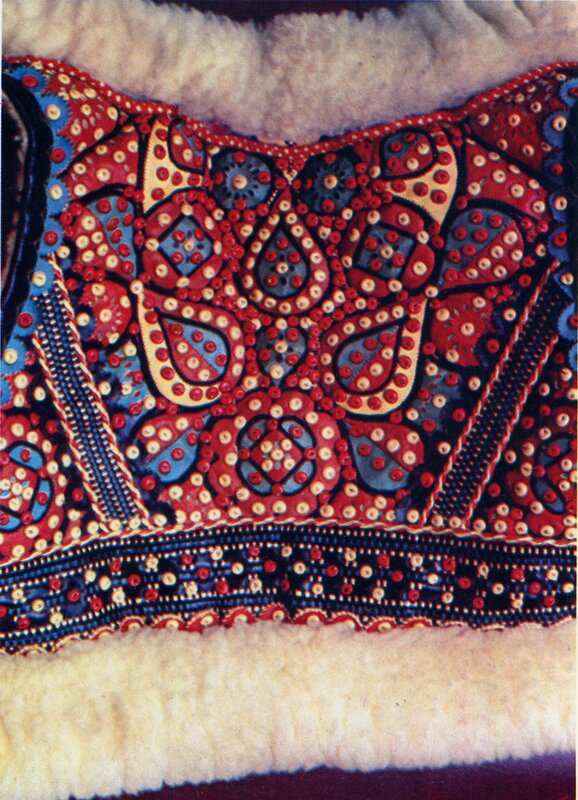 The cuffs are also covered with either woven or embroidered ornament, and the lower sleeves are 'smocked', and embroidery is also done over them, the same sort of cross-stitch design which is done on the other parts of the blouse. Over the blouse a sort of linen jumper is worn, known as the rubača. This laces closed over the front of the blouse, as you can see above. Here is the cut. 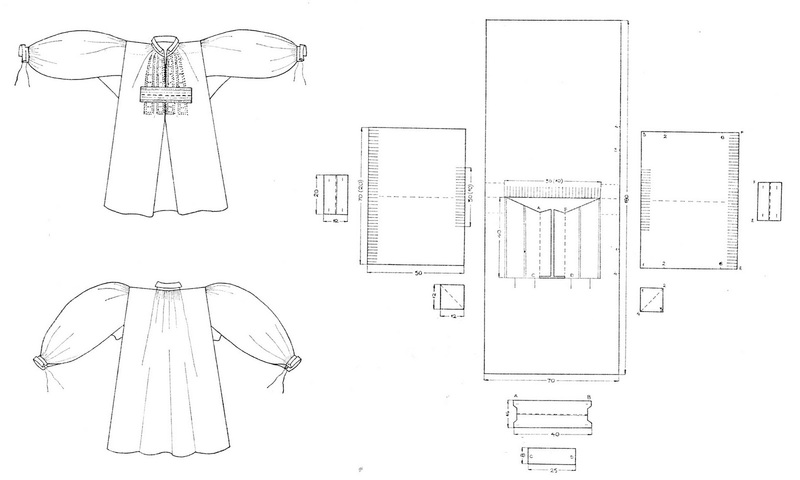 The skirt is smock-gathered into the bodice, and the bodice itself has embroidered or woven ornament along the bottom edge with the same sort of designs. Here are a couple of examples. Over this is worn a sort of cloth belt, called pas. The purpose of this is to gather the fullness of the rubača into the waist. The pas is made of a length of linen with a slightly wider length of heavier wool sewn over it. Here is the cut. Over this is worn the apron proper, which in this region is called fertun. It is made of two fields of linen sewn together. There is a band about an inch or so wide of ornament towards the lower edge. This is usually woven in, but is occasionally embroidered. Over the apron a kerchief is worn, usually folded diagonally, but sometimes lengthwise. It is preferably of silk. Most commonly it is red, but can also be yellow or blue. This is always worn with this costume. A matching kerchief is often worn on the head. Here are a couple of images showing this. See also the other photos in the posting. White knitted knee socks are worn, usually with a texture knitted into them. The 'popcorn' knit is very popular. I have just found a blog by a Croatian woman named Ruzmarinka who seems to be from one of these villages, Shestine. Here is her exposition on some of the stocking designs. 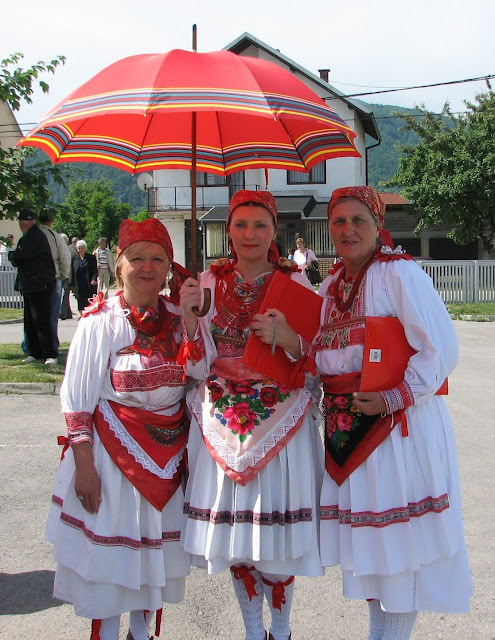 Red garters are worn above the calves, with red ribbon bows just showing below the hem of the rubača. 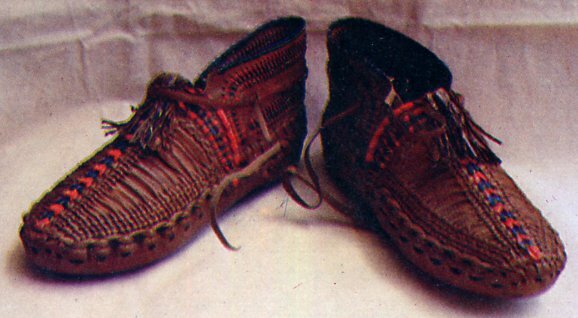 The feet are covered with moccasin type footwear, called opanci. 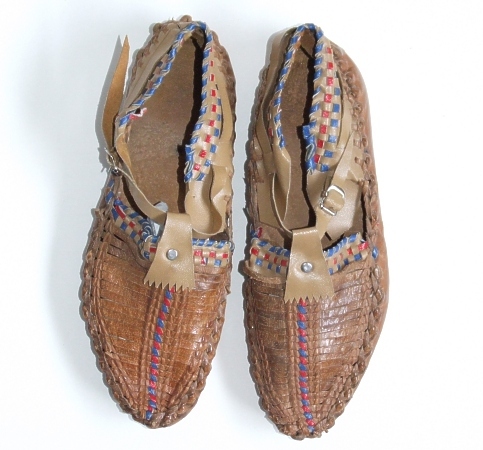 In this region, the uppers are woven with supple narrow strips of leather, some of which are dyed red and blue. This style of opanci are only worn in this region. You will notice that a couple of the photos show high lace-up shoes instead. Tihs is less common. This type of footwear is still made, and one can see them hanging on souvenir stands all over Croatia, like bunches of fruit or strings of onions. They are very popular with tourists. As you will notice if you look at the various images, A necklace with multiple stings of coral is often worn with this outfit. Short lengths of Czech ribbon are often attached in bunches around the neck, and can often be seen over the shoulders. 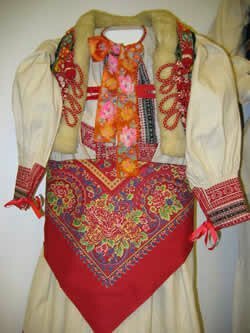 There is a short sheepskin vest worn with this costume, called kožulec. The fleece is turned over onto the right side around the edges. It is ornamented with loops of cord on the front, and leather applique in many colors on the back. Here is the cut and a couple of closeups. As you can see, unmarried girls wore their hair in braids which hung loose, in this case with short bunches of Czech ribbon attached to the ends. Married women also wore their hair in braids which were attached to a rectangular frame at the back of the head, which imparted a particular shape to the headress. This was then covered with a kerchief which was tied either under the chin or at the nape of the neck. A linen cap or a type of linen hood similar to the Italian Tovaglia were also worn. The man's costume is based on a linen shirt with the basic east Croatian cut. It has the same vertical and horizontal bands of woven or embroidered ornament as the woman's. 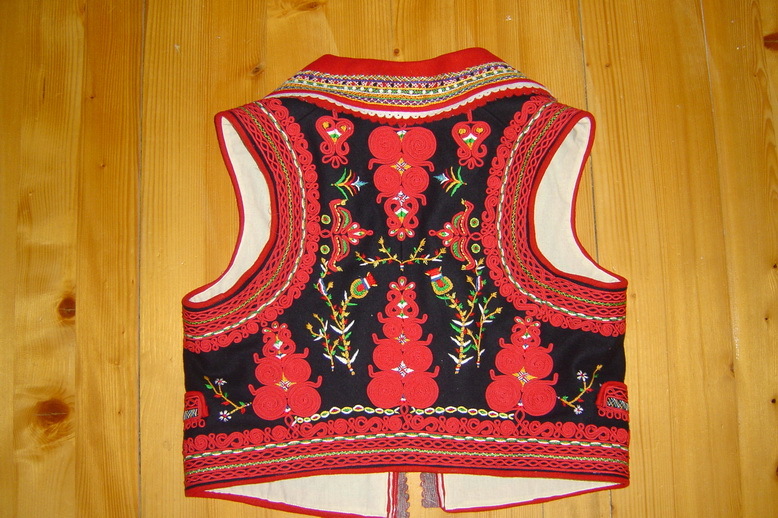 The collar is sometimes done in white on white surface stitching or other embroidery. Here is the cut. In summer, simple linen pants are worn, similar to those over a wide area of Pannonia. In this region they are tucked into black boots. In winter wool pants with braid and a flap in font are worn, but these are seldom seen. Here is the cut of the basic linen pants. The two partial shapes at the bottom are not part of these pants. 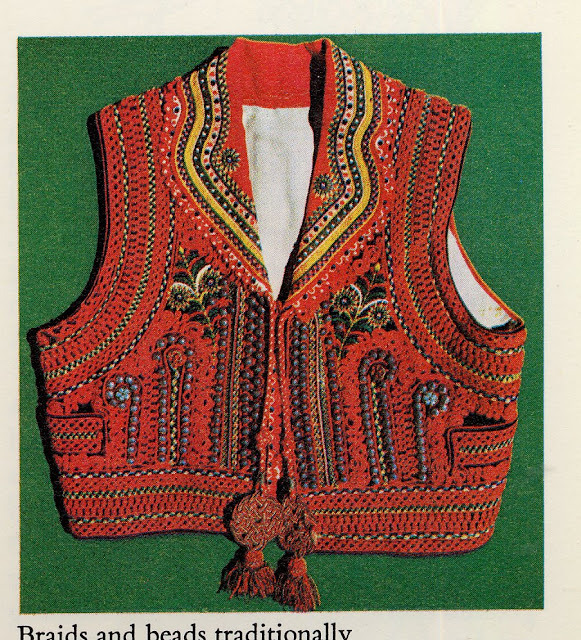 There is a cloth vest, called Lajbek,which is also highly ornamented with braid and studs, and often with embroidery as well. It is relatively larger than the women's. There is almost always a hook shaped ornament on the front, and the back varies quite a bit. 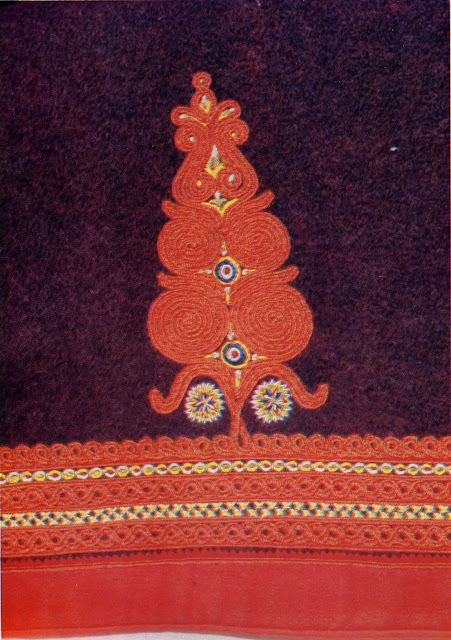 The edges and the lapels are highly ornamented with braid. It has cords in the front which are tied into complex flat knots resembling those of east Asia. Here is the cut and a couple of closeups of the vest. As you can see, the men's costume is completed with a wide leather belt which has a flap that covers the buckles, a small round felt hat, and a jacket. The jacket is called Surka, and is very similar to jackets worn in parts of the Dinaric Mountains and the Carpathians, noteably in Vrlika, Zakopane and the Hutsul area. 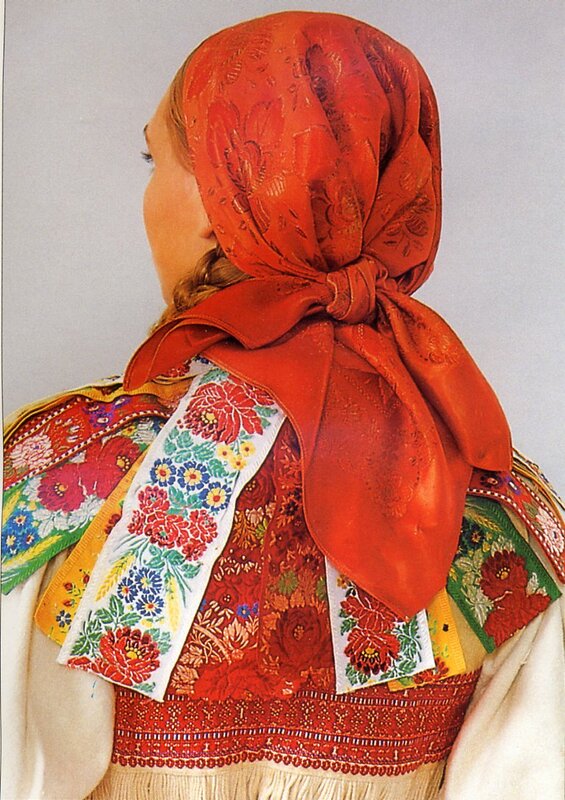 It is made of very heavy homespun wool, and is often worn draped over the shoulders in all of these areas. It is typically made of natural dark wool, and trimmed with braid, although not as heavily as the vest. See the various photos in this posting. Here is the cut and a couple of closeups of the jacket. Apparantly, the people in this region feel that the costume is not complete without the red umbrella with stripes around the edge. Thank you for reading, and i hope that you have found this interesting and perhaps inspiring. Here are a couple of websites i found with more informatiion: The second one is by Ruzmarinka. I have given links to several of the pages of her blog, which is in Croatian. At this one you can buy Croatian Costume Pieces. Ruzmarinka shows in detail how to make and embroidery a rubača, including the openwork in the bottom of the front two seams. Ruzmarinka shows off the embroidery she made for a man's shirt. And finally, two videos, This one is by Ruzmarinka, a bunch of photos, including ones of her, set to quite schmaltzy music. And this one is of the famous Prigorje dance suite by the performing group Lado. Hello, I must say I'm surprised by this post, but proud that my work and my interest identified so far in the world. Nice and described in detail. Thank you for this post! Great post. I am trying to find a Croatian costume for a boy, size 8/10 in US sizes. This is for a school event where the kids are being asked to dress from the country of their ethnic heritage. Any ideas of where to find a complete costume that does not involve me having to sew? I also don't have the means to spend $250 for a single vest. Thanks for any resources you can provide. 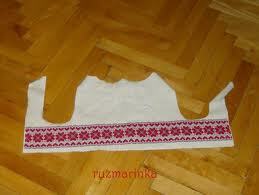 I am studying medieval Croatian embroidery. I was wondering if anyone knew what embroiders in the area called various stitches. They do not seem to translate directly, and I would like to make sure what I am doing is accurate. Aside from quite a few "smaller" mistakes, some of the things written show a great lack of knowledge on the topic (and, thus, spreading misinformation), not to mention one pretty scandalous statement. 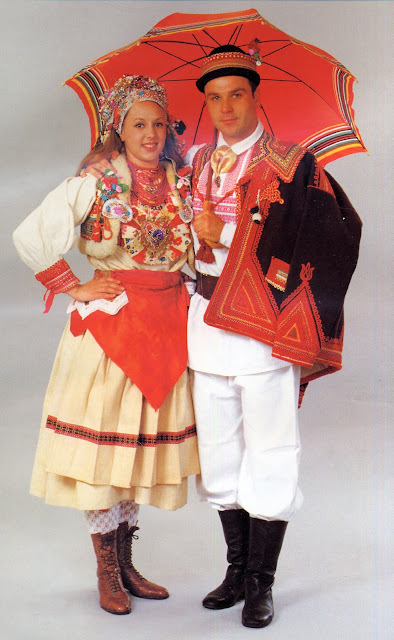 I've also noticed many such mistakes and misinformations on other topics dealing with Croatian costumes, which then makes me doubt the accuracy of information concerning other nations' costumes. Such a pitty! vague disparaging anonymous comments are of no help to anyone. If you feel that something which I wrote is in error, then please inform me as to what exactly is incorrect, that both I and my readers might learn from the information which you possess.